Naturally the common people don't want war; neither in Russia, nor in England, nor in America, nor in Germany. That is understood. and denounce the pacifists for lack of patriotism and exposing the country to danger. It works the same in any country. 16 Jul '09 - The rivalry between Croatian Nikola Tesla and American Thomas Edison at the turn of the 20th century was legend. Tesla worked as an assistant to Edison when he first came to America, designing for him a DC (direct current) system. Edison refused to pay Tesla the bonus he’d promised, so Tesla struck out on his own to develop AC (alternating current) transmission. By 1915 the New York Times reported that the Nobel Prize in Physics was to be jointly shared by Tesla and Edison, though so strong was their personal animosity toward each other that both refused to accept it if the other was named. The prize went instead to two other researchers for work on X-ray crystallography. Six months after Tesla died penniless in 1943, the US Supreme Court invalidated 1909 Nobel winner Marconi’s most important patent for radio transmission and recognised Tesla as the inventor... The people who perform best at one level of an organisation tend to be promoted on the premise that they will also be competent at another level within the organisation. This hypothesis fails in practice; a new position in an organisation requires different skills, so the competent performance of one task may not correlate well with the ability to perform another task well. Two strategies outperform the conventional method of promotion: the first is to alternately promote first the most competent and then the least competent individuals. And the second is to promote individuals at random. Both of these methods improve, or at least do not diminish, the efficiency of an organisation. People stop doing what they are good at because they've peaked in a specific role and can't grow financially, which forces them to stay there indefinitely, leave, or get promoted. Perhaps the real problem is that Big Organisations pay based on title rather than experience and excellence. Operation Plumbbob was a series of nuclear tests conducted 28 May - 7 October 1957 at the Nevada Test Site - the biggest, longest, most controversial test series in the continental US (29 explosions in all). It produced total civilian radiation exposure of 120 million person-rads to thyroid tissue (32% of all exposure due to continental nuclear tests). Statistically, this caused 38,000 cases of thyroid cancer and 1,900 deaths, though no hard data exists on long-term civilian effects. The "Stokes" explosion occurred 7 August 1957. The tail section of a US Navy dirigible is shown with the Stokes cloud in the background. The dirigible was in free flight more than 5 miles from ground zero; it collapsed in the blast shock wave; unmanned, it was used in military blast-and-heat-effects experiments... Able Archer 83 was a 10-day NATO command post exercise starting on 2 November 1983; centred north of Mons, Belgium, it spanned Western Europe. Its realism coupled with deteriorating relations between the US and the USSR and the anticipated arrival of Pershing II nuclear missiles in Europe, led Soviet Politburo members to think Able Archer 83 was a ruse, obscuring preparations for a nuclear first strike. This documentary focuses on 8 November 1983 - now recognised as one of the most dangerous moments in the Cold War. A series of accidents nearly unleashed World War III: on 1 September the USSR downed Korean passenger airliner KAL 007 (killing everyone onboard); on 26 September the setting sun reflecting off high clouds repeatedly set off the launch siren for the orbiting Soviet Early Missile Warning System. Senior Soviets convinced themselves they were about to come under nuclear attack; their vast nuclear arsenal (missiles, bombers, submarines) went on maximum alert, ready to launch full nuclear retaliation. Armageddon beckoned. I found this sequence of events chilling. Intelligence communities in the US, Europe and the former USSR denied the scale of this crisis for years. 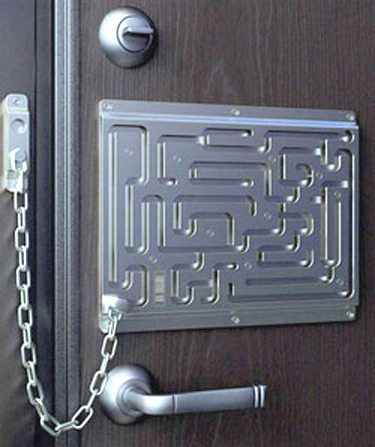 The Lebedev Defendius door chain lock defies entry because it is a door chain with a labyrinth, and is only long enough to reach the end of it. Personal security can be fun?... Wellington ranks 139 out of 143 cities across 6 continents in the Mercer worldwide Cost of Living survey, carried out in March. Tokyo, ranking number 1, is the most expensive city and Johannesburg the cheapest. The survey measures the comparative cost of more than 200 items, including housing, entertainment, clothing, food and transport in each location. A reshuffle in rankings because of the global economic crisis and currency fluctuations means Wellington dropped 46 places and put Auckland one spot ahead at 138, down from 78 last year... Regarding US social security: for people who choose to defer benefits until age 66, it takes about 12 years to collect as much as if you'd started getting cheques at 62 - so you break even, so to speak, at age 78. If you're in good health and expect to live to 78 or longer, then the advantage goes to the person who waits. Single people already in poor health who probably won’t live past 78 (give or take a couple of years) perhaps shouldn't wait but those still working would want to defer. For married couples: the higher-earning spouse could delay benefits until age 70, while the lower-earner collects at age 62. This ensures the surviving spouse ends up with maximum benefits for the rest of his or her life. Even if the higher earner dies before age 70, survivor’s benefits are bumped up to what the deceased spouse would've got. Once the higher-earner hits full retirement age, he/she can "file and suspend" - file for benefits but immediately suspend them. This allows the lower-earning spouse to get up to half the higher earner’s benefits even while they continue to accrue. This gets the most out of the system. Married people with similar earnings may consider having one person claims spousal benefits at full retirement age, then switch to his or her own (presumably higher) benefits later. Columnist Peggy Noonan on the subject of Sarah Palin: In television interviews she was out of her depth in a shallow pool. She was limited in her ability to explain and defend her positions, and sometimes in knowing them. She couldn't say what she read because she didn't read anything. She was utterly unconcerned by all this and seemed in fact rather proud of it: It was evidence of her authenticity. She experienced criticism as both partisan and cruel because she could see no truth in any of it. She wasn't thoughtful enough to know she wasn't thoughtful enough. Her presentation up to the end has been scattered, illogical, manipulative and self-referential to the point of self-reverence. "I'm not wired that way," "I'm not a quitter," "I'm standing up for our values." I'm, I'm, I'm. In another age it might not have been terrible, but here and now it was actually rather horrifying... Random Palin Resignation Speech Generator... From the Comments section to the Slate article Broken Is Beautiful: Breaking Your Legs to Make Yourself Taller: "I have a friend who had his leg amputated voluntarily. He suffers from BIID (Body Integrity Identity Disorder) and has always had an overwhelming feeling that he should have been an amputee so he sought out surgery in a foreign hospital and is now very happily one-legged. He is in no way crazy and is in fact incredibly accomplished and balanced. Why should he have had to seek treatment for a recognised medical condition outside of the USA? Doesn't he have the right to control his own body?" Wow. I am generally against regulation - but are there times when people SHOULD be protected against themselves? First, we have a face transplant to correct the ravages of a dog attack. Then people want a face transplant to make themselves more beautiful. My thought is that regulation will slow change, but that change is inevitable regardless... 50% of women still married after 4 years said, given the chance to do it all again, they would not marry the same man. By that time, the average couple is down to 4 minutes of meaningful conversation a day. The street price of cocaine varies enormously. Generally, the farther away a country from the main producers and the more isolated it is, the higher the price charged. The priciest places for a cocaine habit are New Zealand and Australia, where a gram typically costs $312 and $285 respectively. Prices in Canada and America, after years of cheaper drugs for Canadians, are now on a par at around $97 a gram. I am currently away from NZ (until 26 July) in New York City (I arrived 3 July). I 'm staying in Battery Park City, one block from the Hudson River. it was the nation's largest display, with more than 22 tons of pyrotechnics. I was one of 2 million people lining the banks of the river - but it was worth it. There were six barges each shooting off the same thing at the same time. Several used the colour blue, which was nice - but the programme wasn't as creative as I had expected. I don't mean to complain, however - it was free and it was lovely and it brought a lot of pleasure to a lot of people - even some New Jerseyans on the opposite bank. Smokers, heavy drinkers and other habitual substance users know that the effort to squelch a longing for a smoke or a drink can bring to mind all the reasons to break the habit; at the same time, the desire seemingly gets stronger. The risk that people will slip or "lose it" depends in part on the level of stress they are undergoing. According to Google, several billion web pages are added each day. In the minute it takes you to read this, the total will leap by about 700,000. Internet traffic is growing by about 50% annually, with video and music streaming rising fastest. 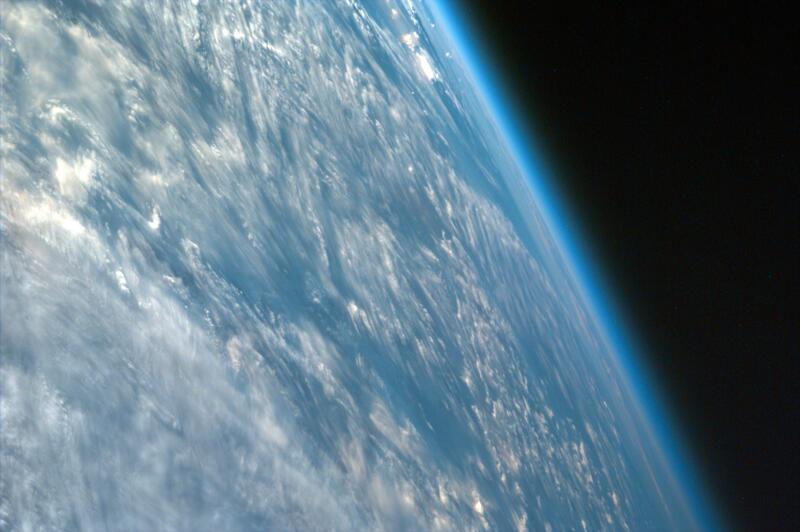 An average of 210 billion emails were sent daily in 2008, 78% of which were spam. E-commerce spending was 6.8 trillion, or 15% of the world GDP. By 2012, Asian surfers will outnumber North American by 3 to 1; India will be 3rd. The web will be dominated by English, Mandarin, Hindi, Portuguese and Russian languages. Air New Zealand's latest safety video, called "Bare Essentials of Safety," shows 3 cabin staff and the pilot, all in uniform-coloured full body paint - and nothing else - talking viewers through the aircraft's safety procedures. NZ's national airline adopted this cheeky way to encourage passengers to watch its in-flight safety video. (It appears to be working.) The body paint idea is also being used in a series of tv ads in NZ, which include the promise: "At Air New Zealand, our fares have nothing to hide"... If you spend much time at airports waiting to transfer and if you try to amuse yourself by watching baggage handlers through the plate glass windows, you'll have seen at least one suitcase go flying off a sharply-turning baggage train and skid along the ground. Musician Dave Carroll tried unsuccessfully for more than a year to get compensation from United Airlines for what he calls "a vicious act of malice" at O'Hare International Airport last year. Flying between Halifax and Nebraska, he switched planes in Chicago. The passenger next to him noticed baggage handlers tossing guitar cases outside the plane. Carroll's guitar required C$1,400 (NZ$1,943) in repairs and still doesn't play the way it used to. When the airline refused to take responsibility, the songwriter made a humourous music video and posted it online... Diller+Scofidio have one of the most innovative websites I've ever seen - try interacting with it a bit to see what I mean. They're located here in New York City, a husband/wife team of architecture professors who became the first architects to win a genius grant from the MacArthur Foundation in 1999... Are you a female with migraine headaches? There may be an upside - it seems women with migraines have a 26% less chance of getting breast cancer - true despite age, drinking habits, smoking, hormone replacement therapy - or any other variable yet discovered. It is unknown how migraine confers this apparent protection. An amusing example of conservation in action. Eskom is South Africa’s national electricity supplier. Apparently they have run into problems with demand outstripping supply. When an image includes stationary and moving subjects (for example, fixed street and moving cars or camera in car showing fixed dashboard and moving scenery), a slow shutter speed gives interesting effects such as light trails. Long exposures are easiest in low-light, but can be done in brighter light using neutral density filters or specially designed cameras. 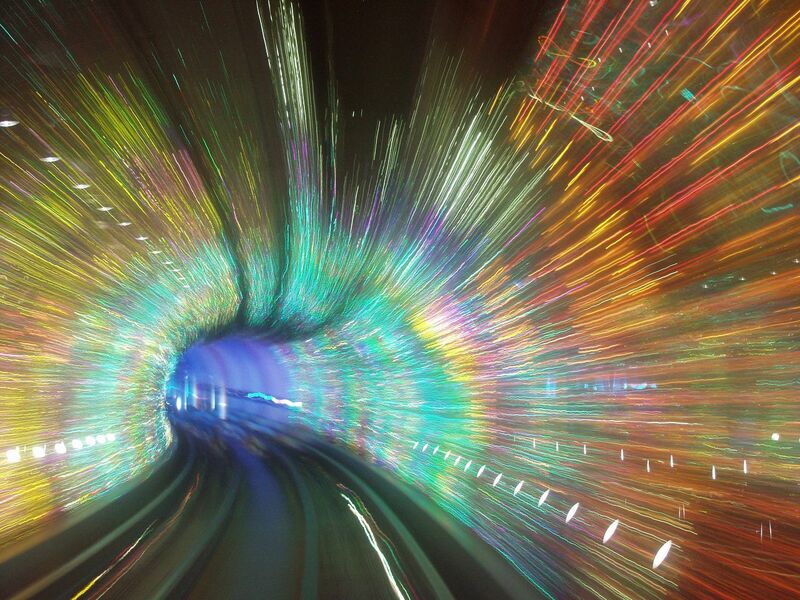 This one by Markus Bahlmann is the Bund Sightseeing Tunnel in Shanghai, a fast connection between the Bund (Puxi side) and the Oriental Pearl Tower (Pudong side). Flashing multicoloured lights and house music make the trip a multimedia disco-type experience. Bir Tawil or Bi'r Tawil (meaning water well) is a small area along the border between Egypt and Sudan, two countries whose political boundary was set in 1899, defined as the 22° north circle of latitude. Bir Tawil (in yellow) is 2,060 km² in size. It came under Egyptian administration in 1902 because it was grazing land of the Ababda tribe based near Aswan, Egypt. At the same time, the Hala'ib Triangle north of the two countries' boundary (northeast of Bir Tawil, in orange) came under Sudanese administration because the tribes of this area were based in Sudan. Hala'ib Triangle, Bir Tawil, Egypt and Sudan come together at one quadripoint. Egypt wants to keep the 1899 boundary because that gives it the larger Hala'ib Triangle; therefore, it cannot claim Bir Tawil, which it was awarded in the 1902 ruling. Sudan wants the 1902 boundary, which gives it the larger Hala'ib Triangle; therefore it cannot claim Bir Tawil because the 1902 ruling gives that to Egypt. So no one claims Bir Tawil, perhaps the only land area of the world except Marie Byrd Land in Antarctica which is not claimed by any state. It would be difficult if not impossible for any third state to claim the area, since it is accessible only through Sudan or Egypt... Living in a windy - and frequently rainy - city such as Wellington is hard on umbrellas. I've tried a couple of vented golf umbrellas that were supposed to be able to be used in strong winds only to find they didn't always perform as advertised. Does the Senz umbrella? It is said that the Senz does not invert and that it is windproof up to wind force 10 (100 kilometres per hour). I haven't tested it because it isn't for sale in NZ as yet. It is available in the Netherlands, Belgium, Luxemburg, the US, Canada, UK, Ireland, France, Germany, Austria, Switzerland and Japan. If it really works, then it'll make it to NZ eventually, no doubt... Don't expect that your resume has been read by the interviewer ahead of time. Interviewers don't want to know much about you but instead where you've worked, how long, on what, and did you get any promotions? Skip details; highlight what makes your experience unique. No typos or unfamiliar words or terms allowed; no date gaps: if you've been unemployed, say so. Don't offer references or use a pdf format; take a hard copy with you; don't use fancy paper and have a short, punchy cover letter! 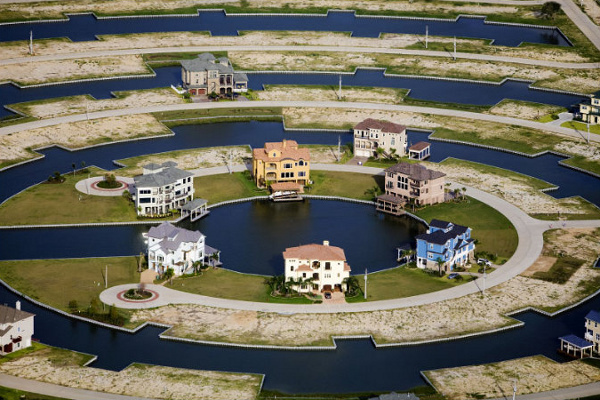 Intriguingly-shaped communities as seen on Google Maps: Developers in Galveston decided to build a planned community (Harborwalk) on the wetlands in Galveston and came up with a strange design where houses sit on rings of land which, from above, resemble concentric ripples on the water. At the moment the town is still under development, hence the numerous gaps where homes should stand. Is it just me? Looking at this, I wonder why anyone would want to live there. Presumably the rings don't float, but are built up. Was the view at high tide? Does a strong wind inundate the houses with seawater? Does trash collect in the canals? Does the water in the inner rings get somewhat stagnant? Are mosquitoes a problem? Flooding? But perhaps all those things have been worked out. There are other "intriguingly-shaped communities" on the site but I thought only the one in the Netherlands was beautiful (via Presurfer). The US went into the red the first time in 1790 when it assumed $75 million in war debts of the Continental Congress. Alexander Hamilton, the first treasury secretary, said, "A national debt, if not excessive, will be to us a national blessing." Some blessing. Since then, the US has only been free of debt once, in 1834 - 1835. The national debt has expanded during times of war and usually contracted in times of peace, while staying on a generally upward trajectory. Over the past several decades, it has climbed sharply - except for a respite from 1998 to 2000, when there were annual budget surpluses, reflecting in large part what turned out to be an overheated economy. The debt soared with the wars in Iraq and Afghanistan and economic stimulus spending under President George W Bush and now Obama. The odometer-style "debt clock" near Times Square - put in place in 1989 when the debt was a mere $2.7 trillion - ran out of numbers and had to be shut down when the debt surged past $10 trillion in 2008. On 1 July 2009, according to the Treasury Department, which updates the number "to the penny" every few days, the national debt was $11,518,472,742,288. Taking painkillers can dramatically increase the risk of high blood pressure - half of men over 65 will have hypertension to some degree and this also increases their chance of a heart attack or stroke. Taking just one daily non-steroidal anti-inflammatory drug (NSAIDs), such as ibuprofen, was found to raise the risk by 38%, while a daily aspirin upped the risk by 26%, according to an authoritative study by Harvard Medical School involving 16,000 male health professionals. Those who took about 15 tablets or more a week had a 48% increased risk. It is thought this was caused by the analgesics inhibiting the effects of chemicals that relax the blood vessels (and lower blood pressure). Further, men suffering from patchy hair loss - known as alopecia areata - should go to the dentist, not the barber. Scientists at the University of Granada, Spain, have found a link between gum disease and baldness. Experts already knew that alopecia areata is linked to genetics and stress. Now it's also been shown to be triggered as the result of an immune system response to a mouth infection. As many as 75% of adults in the US have been affected by periodontal disease and an estimated 80.7 million adults (1 of every 3) have been a victim of cardiovascular disease [CVD] according to the American Heart Association. From the 80.7 million adults in the US, 38.2 million are less than 60 years of age, which is almost 50%. There is a positive connection between the growth of blood vessel walls, a symptom of CVD, and the existence of bacteria found in dental plaque causing periodontitis. Periodontal disease, more commonly known as gum disease, is a basic inflammation and infection of the gums and surrounding tissues in the mouth. As the main cause of gum disease, bacterial plaque (sticky, colourless film, which forms on the teeth) hardens into a rough porous substance, which then releases toxins produced by the bacteria in the plaque, which eventually lead to a breakdown of the fibres that hold the gums tightly to the teeth. As the disease progresses, toxins and bacteria make their way down the tooth until the bone that keeps the tooth in place is broken down and the tooth eventually falls out. Treatment for periodontal disease includes a cleaning process, which removes plaque and tartar around the tooth, smoothing the root surface. Antibiotics are administered to diminish the effects of the treatment. In more severe cases, surgery is required in the form of cutting the gums to remove hardened plaque build-up and refiguring the bone. This reduces the incidence of heart attack as well. The alternative? Brush and floss twice a day. Is that asking too much? Sorry to burst your bubble: images were taken with a slow-motion camera to show every stage of the soap bubble's disappearance. 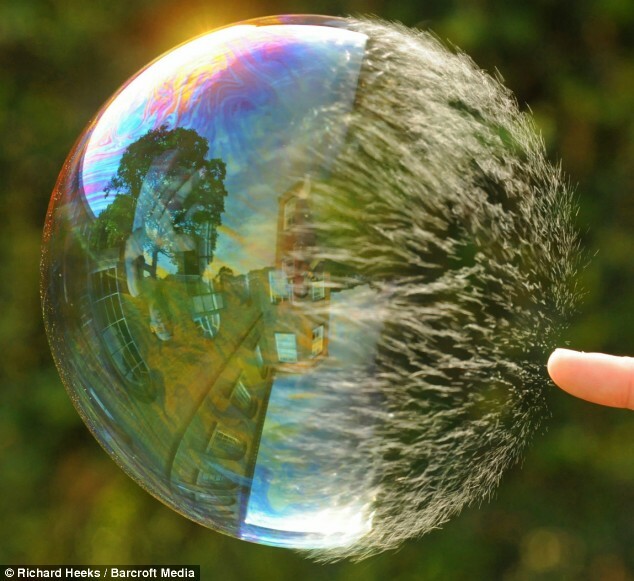 A bubble is made up of 3 layers - one thin layer of water sandwiched between 2 layers of soap molecules. As the finger breaks the surface tension, the perfect sphere is replaced by a round mass of soapy droplets which dissolve into the air. Feminism is generally associated with a modern, progressive society. Yet ancient Sparta - infamous for militarism - granted women exceptional rights. Spartan women could inherit, own, and bequeath property; they were fed and schooled as much as men; they had complete freedom of movement; they married later and could even get away with adultery. So why would the tough Spartan men allow this to happen? Upon subjugating its neighbours - whose population vastly outnumbered Sparta’s - Sparta needed its males to focus entirely on training for war and its females to focus on managing the subjugated population and estates. To give the women sufficient capability and incentive, especially in the absence of men, the men had to grant the extra rights to women. However, as in modern times, more autonomy for women was associated with lower fertility, which ultimately led to Sparta being unable to field a large enough army, losing control of its subjugated neighbours, and rescinding the rights of its women. What explains the rise of fascism in the 1930s? The emergence of student radicalism in the 1960s? The growth of Islamic terrorism in the 1990s? The Rwandan genocide of 1994? Ethnic conflict in the former Yugoslavia and in Iraq? Acts of torture and humiliation by American soldiers at Abu Ghraib prison? The American financial crisis of 2008? The widespread belief, in some parts of the world, that Israel or the United States was responsible for the attacks of September 11, 2001? And what, if anything, do these questions have to do with one another? The unifying theme is simple: when people find themselves in groups of like-minded types, they are especially likely to move to extremes. And when such groups include authorities who tell group members what to do, or who put them into certain social roles, very bad things can happen. Political extremism is often a product of group polarisation and social segregation is a useful tool for producing polarisation. Moral? 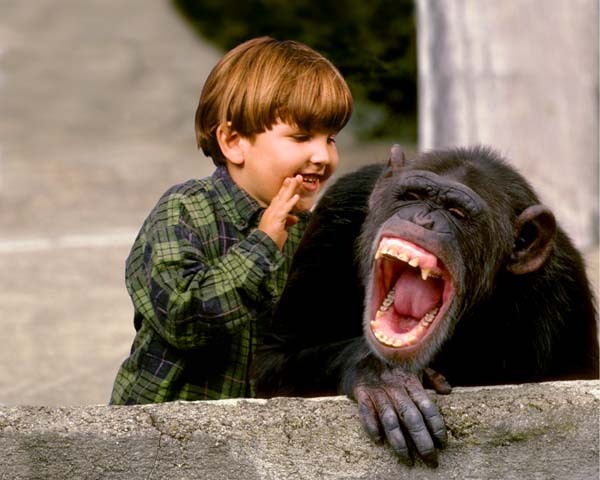 Choose friends of differing ages and political beliefs. "for proof denies faith, and without faith I am nothing."